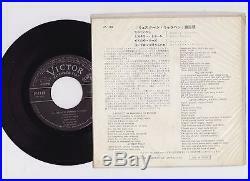 ELVIS PRESLEY JAPANESE ORIGINAL 45rpm EP. See picture for scratches or damages. The photo gives priority to the condition. Victor custom poly-lined wraparound sleeve VG condition Spine & seam is No split. 4-Tracks: I Forgot To Remember To Forget Mystery Train Yellow Roses(Hank Snow) Cryin' Prayin' Waitin' Hopin'(Hank Snow). We are delighted to be able to offer one of the rarest commercial release Elvis collectables, the extremely rare 1957 Japanese 4-track 7 vinyl EP on the silver & black Victor label, still housed in the original unique Victor custom poly-lined wraparound picture sleeve. Only as a guide of Quick Condition Check. The condition of the disk is viewing. Record is used, Surface noise will may be evident upon playing! 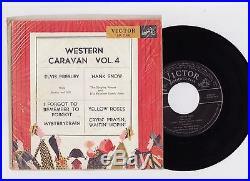 The item "Elvis Presley 1956 Japan Only EP WESTERN CARAVAN, VOL. 4 EP-1146 Japanese" is in sale since Wednesday, May 17, 2017.